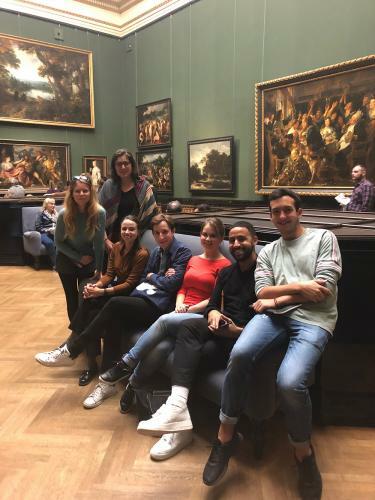 Seminar Trip to Vienna (October 18-21, 2018): "HSAR 837: The Painting of Modern Life"
Over October recess, students in the fall 2018 graduate seminar “The Painting of Modern Life” traveled to Vienna for a study trip centered on the Pieter Bruegel the Elder retrospective held at the Kunsthistorisches Museum. The course, led by Professor Marisa Bass, considers Bruegel as a pivotal figure in charting the development of genre painting in the Low Countries. The trip began with visits to St. Stephen’s Cathedral and the Kaiserliche Schatzkammer, which offered an opportunity to situate the Viennese collections within a history of artistic consumption and display in the Holy Roman Empire. At the Albertina Museum print room, students examined rarely exhibited drawings and prints by Bruegel and Hieronymous Bosch with Laura Ritter, curator of Netherlandish and French art. Tracing the Boschian tradition continued at the Theatermuseum, where the Last Judgment triptych attributed to Bosch is on view, temporarily relocated from the Akademie der Bildenen Künste. Later, at the Secession, students encountered a landmark of Viennese modernism in Gustav Klimt’s Beethoven Frieze. The ensuing days were devoted to careful study of the Bruegel exhibition and the Kunsthistorisches Museum’s permanent collections. Looking at works by Pieter Aertsen, Joachim Beuckelaer, and Frans Snyders, students contemplated evolving approaches to representing daily life in depictions of the kitchen and marketplace. Students also perused the museum’s Kunstkammer, or cabinet of curiosities, and its vast holdings of European painting. In the final hours of the trip, students independently visited other Viennese sites of interest including the Leopold Museum, Imperial Carriage Museum, Natural History Museum, and Globe Museum.